If you told me to make a dessert with coconut biscuits, caramel and peppermint chocolate I would say that is way too many flavours in one dish! Yet Peppermint Crisp Tart is one of the most well-loved desserts in South Africa, proving that the flavours work together fabulously. 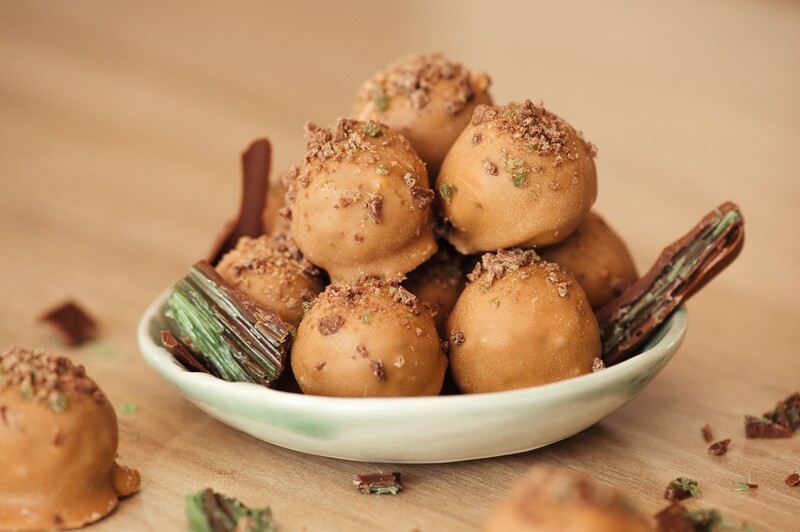 These Caramel Peppermint Crisp truffles combine all the delicious flavours of the famous dessert into little bite-sized balls of joy. If you can bear to give them away, these would make a fabulous gift for that friend of yours. You know, the one who LOVES Peppermint Crisp Tart – we all know at least one! Process the Tennis Biscuits in a food processor until you have fine crumbs. Add in the Caramel Treat and blend until smooth. Finely chop the Peppermint Crisp bars. Set aside 3 tablespoons of the crushed chocolate for later. Add the remainder to the biscuit mixture and blend until evenly mixed. Roll the mixture into balls (approximately 2 teaspoons each) and place onto a baking tray lined with greaseproof paper. Refrigerate for 1-2 hours, until firm. Melt the caramel chocolate over a pan of simmering water (or in the microwave). 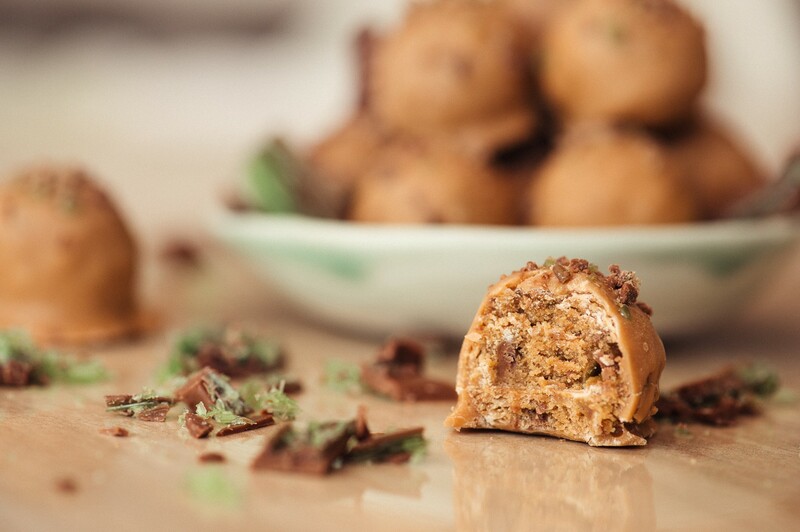 Dip each caramel peppermint crisp truffle into the chocolate and coat completely. Place onto a lined baking tray and quickly sprinkle with the reserved crushed Peppermint Crisp before the chocolate sets. Place the coated truffles back into the fridge until ready to serve. For more Peppermint Crisp tart inspired treats, see here and here.